It is comforting to us to report happy news. Our garden is the best it has ever been! 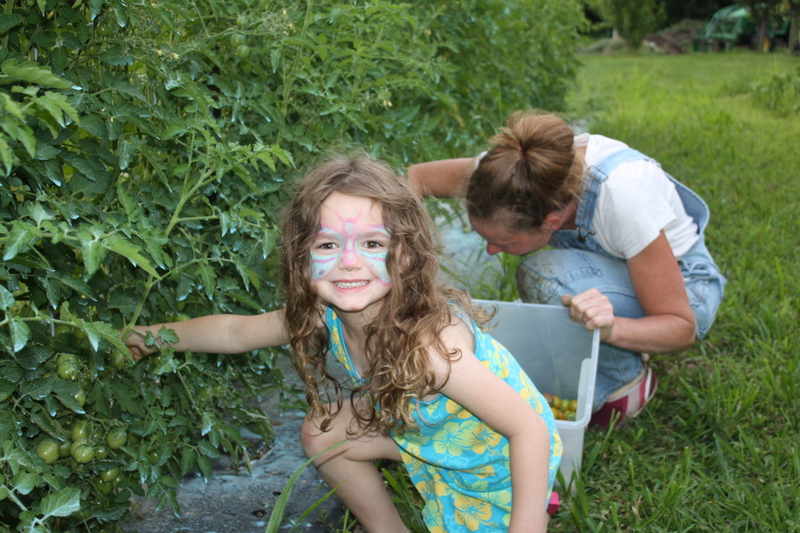 The vegetables are thriving, the proper crop rotations are getting in the ground at the proper time, weeds are at a minimum and we are managing to stay in front of them, our work load does not seem overwhelming, we sleep well and have time for play with Maeve. We have hit our stride and it feels good. So, we weed, water, harvest and plant something every day and then repeat it the next day. A simple, focused life here. A long chilly week of day and night temperatures have slowed down a few crops-TOMATOES! They are coming and I am sure with the warmth projected this week we will see more color. Beans are chugging along but we have yet to pick the big mother load. Remember these itty bitty beauties last week? We should start picking tomorrow. 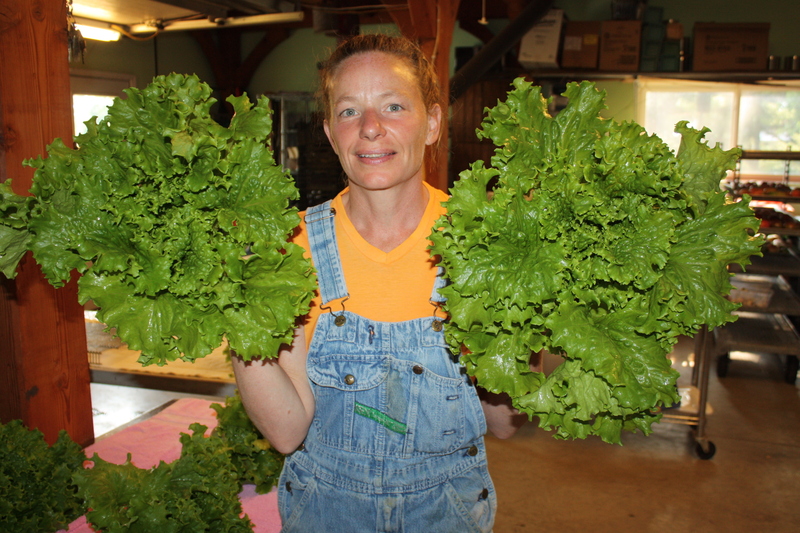 This cold July has been wonderful for our leafy green crops and this weeks lettuce harvest is amazing! 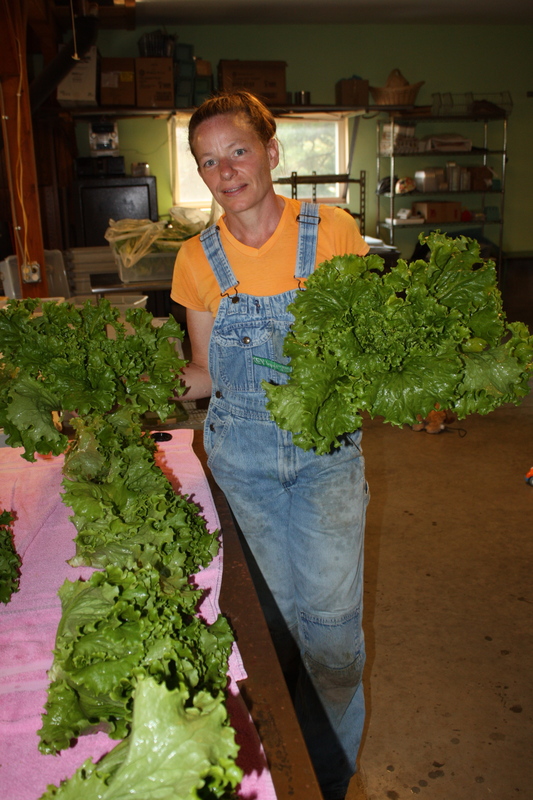 This weeks lettuce harvest ready to cut. 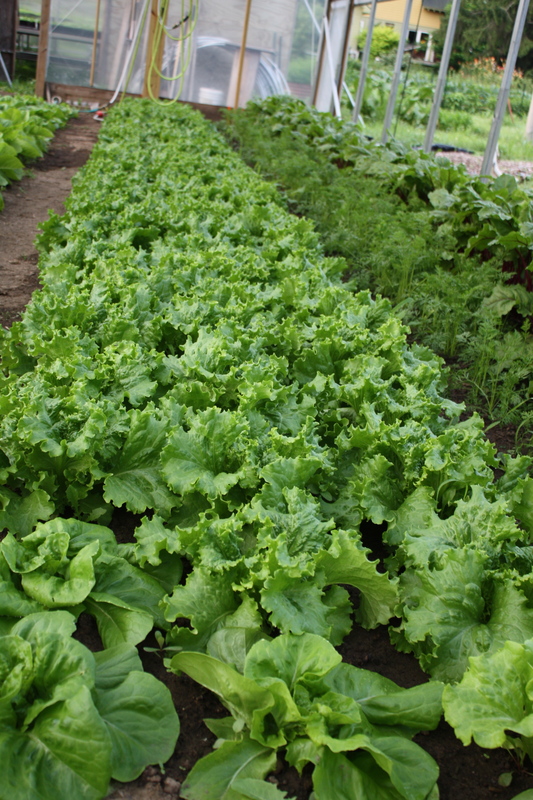 Tropicana is this variety and it is the perfect summer lettuce. We seeded in another long section of storage carrots and this week’s temperature is perfect for germination. Carrot section under row cover. 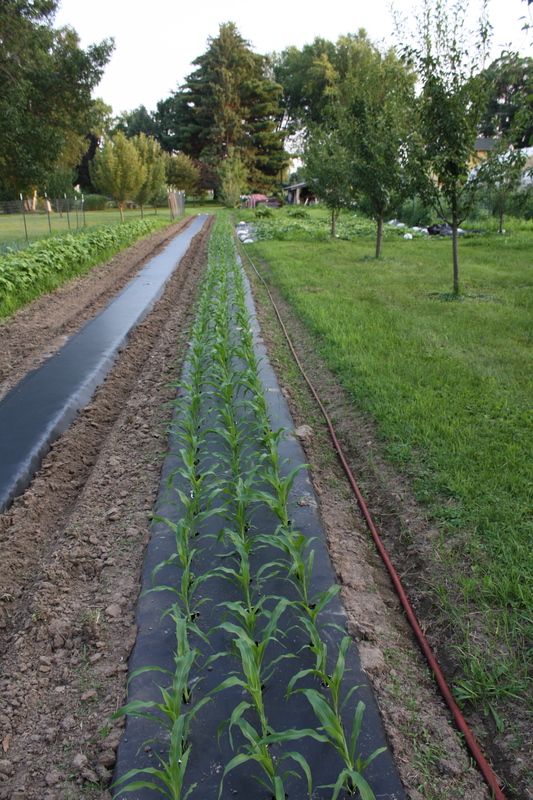 The big popcorn experiment is doing well……we are shooting for knee high by the end of July. To the left is the new zucchini section. Where the garlic once grew. 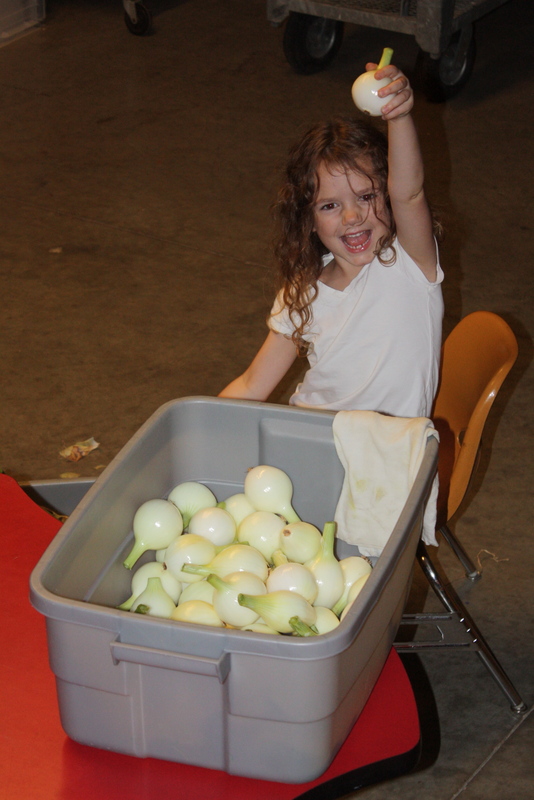 Scott finished the garlic harvest! It is counted out, our seed garlic for next year portioned off and all hanging to cure. 1300 bulbs are drying in the shed. A successful and bountiful harvest. Onions and shallots are just about ready. We snuck an onion off of for everyone this week for a taste. We sampled a shallot last night at supper and it was sweet and delicious. 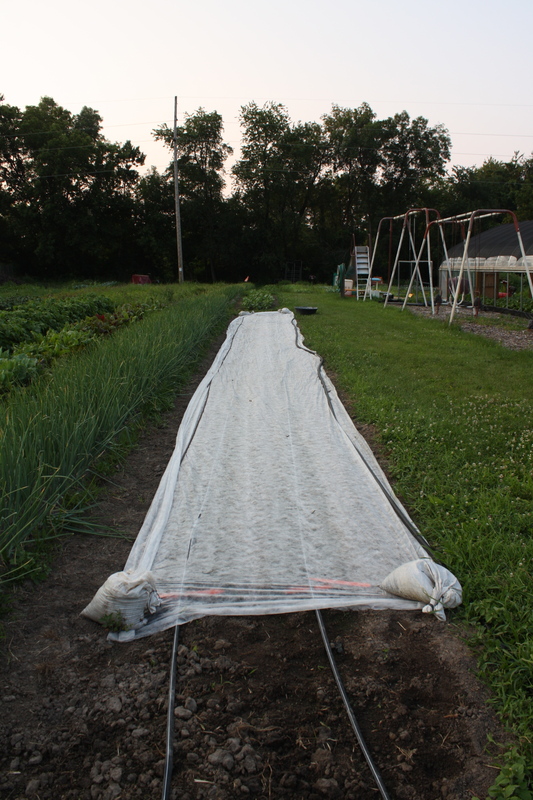 We are excited to offer shallots for this first time in our CSA shares. 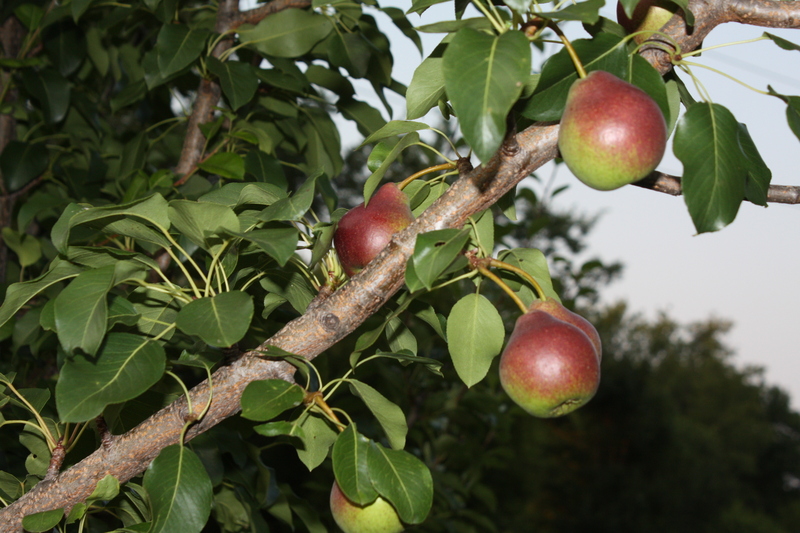 Pears are not as prolific as the HUGE! harvest last year but they are ripening up. We are hopeful the volume is there for weekly shares. Pears in our little mini orchard. The greenhouse is full again of little basil plants. I like to restart a huge batch so we all have fresh juicy succulent leaves when the tomatoes really hit. Another wonderful week of harvest. Enjoy! 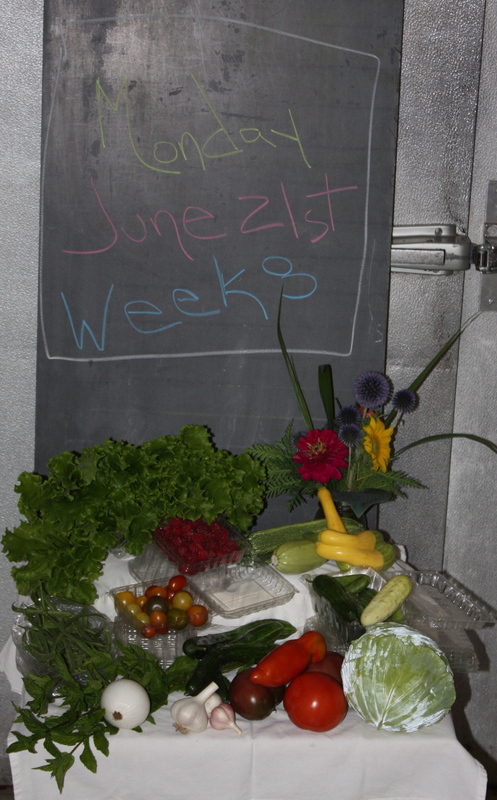 414 pounds of food this week! Lettuce-HUGE! heads of a tasty variety called Tropicana. Garlic-Another fresh bulb of this favorite crop. We will take a few weeks break from offering it again while it cures in the shed. Mint-Refreshing. Add to salads, fruit or a nice addition to cucumber water. Summer Squash-An assortment of these little beauties. 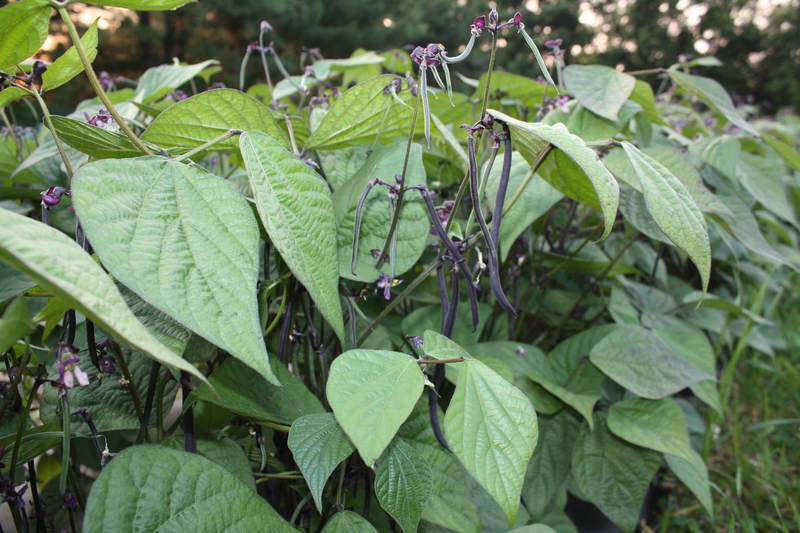 Green Beans-Traditional American long round green beans OR the elongated flatten European variety. Slicing Tomato-Here they come. Enjoy. 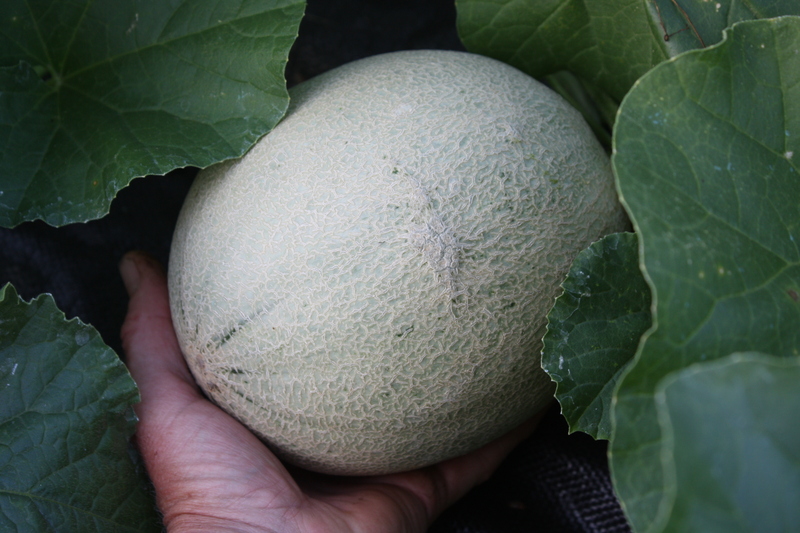 We grow many different varieties-primarily Heirloom so you will experience a huge range in color, taste and size throughout the season. 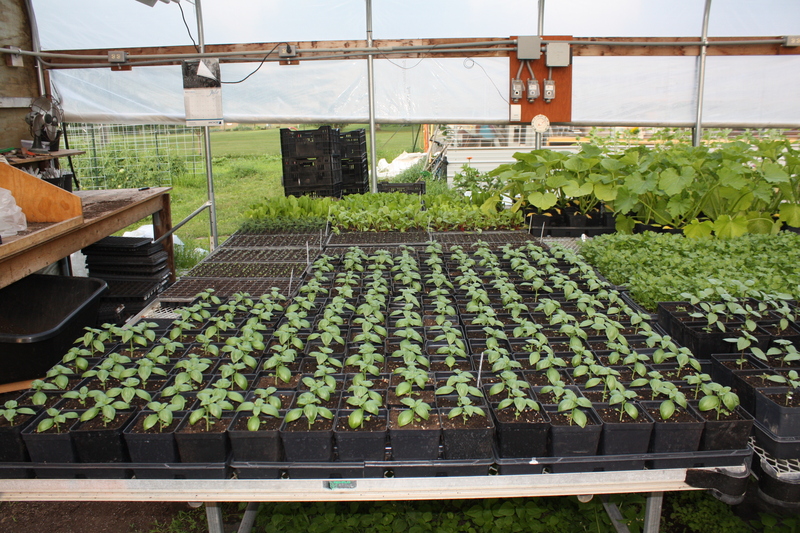 Eggplant-An assortment of midsize varieties. Cucumber Mix-Hope you are LOVING!! those little mini thin skinned wonders. We are! Also, a few American true pickling cucumbers in the mix too. These have the spines and a more bitter/tougher skin. 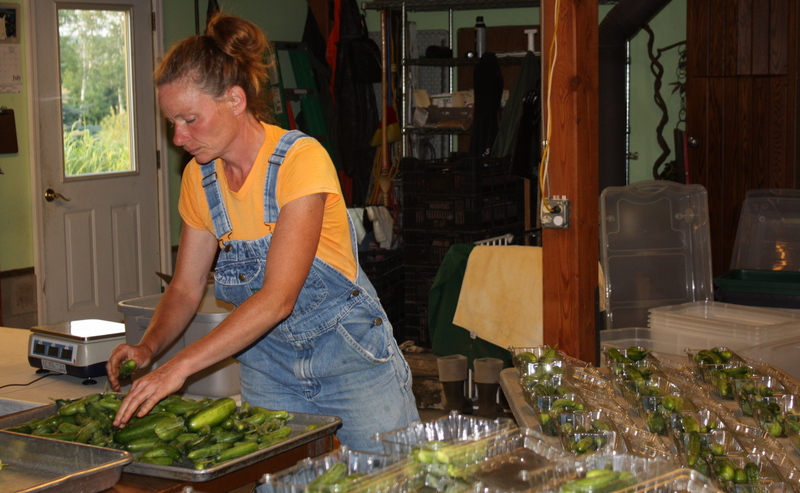 Sorting out the cucumber harvest for this weeks share. 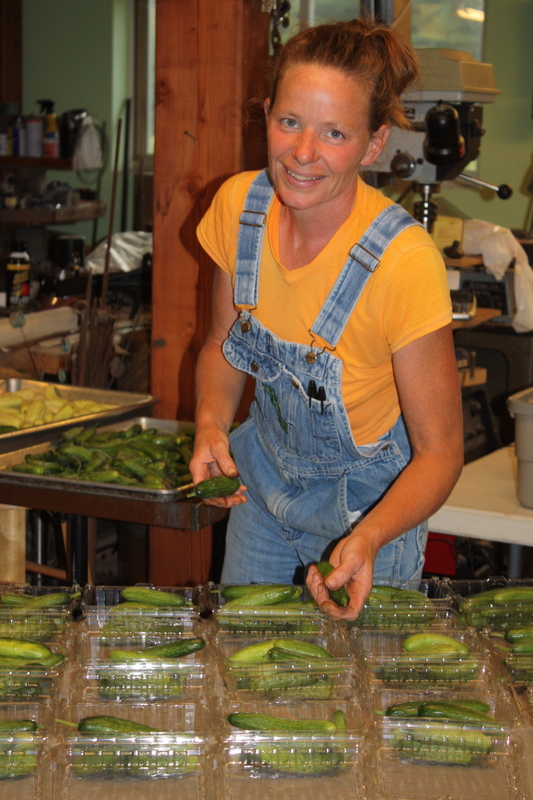 Dividing up the delicious mini snacking cucumbers. Long Skinny Slicing Cucumber-1 in each share. Onion-A taste of the delicious summer onion crop to come. Garlic-A few bulbs of this favorite crop. We will take a few weeks break from offering it again while it cures in the shed. Mint-Refreshing. Add to salads, fruit or an addition to cucumber water. Cherry Tomatoes-1/2 Pint mixed container of these tasty little gems. 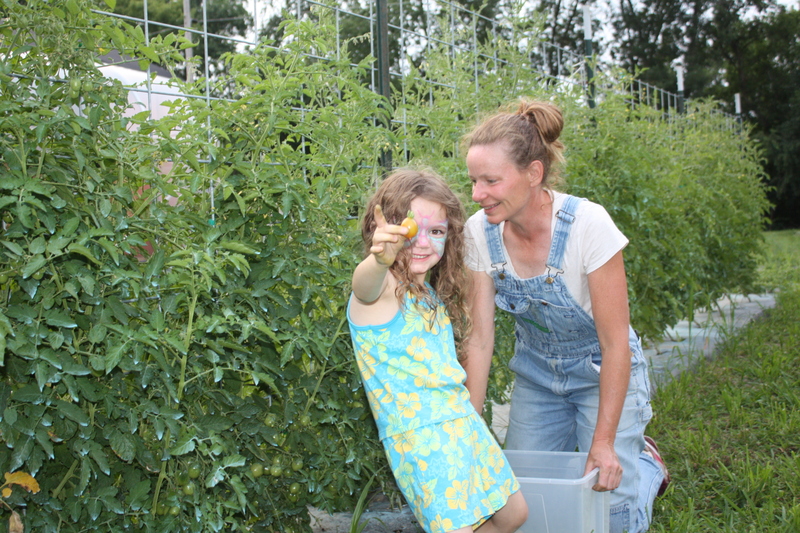 Maeve helped pick the Cherry Tomatoes this week. Long Skinny Slicing Cucumber-2+ in each share. Cabbage-A delicious mid season slightly flattened head. Bouquet OR Berries-the Full share is split this week. 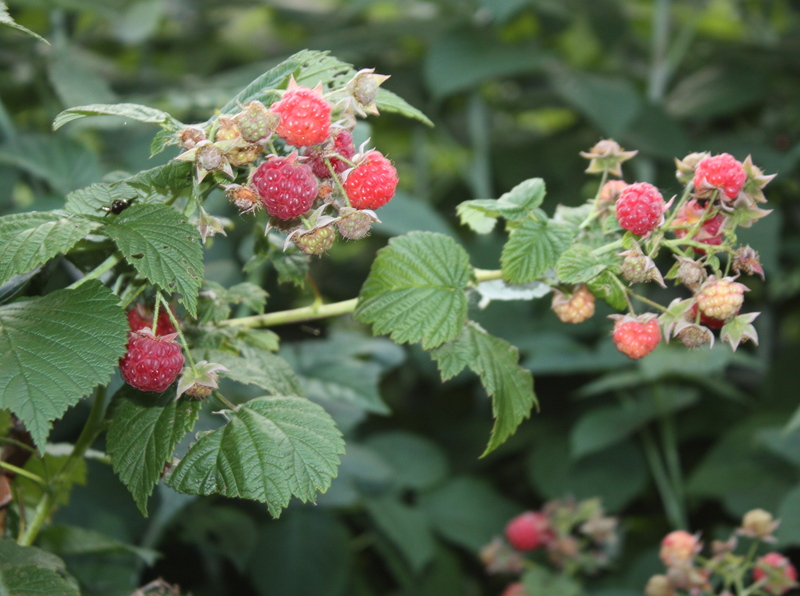 You will receive a garden flower bouquet or a 1/2 pint of Raspberries. Next week we will switch. Fantastic raspberry year for us. The first year the patch is big enough to include them in the share. 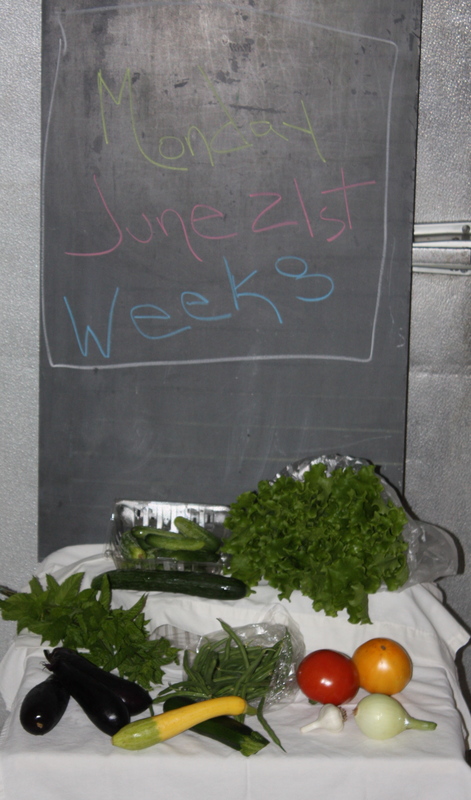 BEST GUESS FOR NEXT WEEK-potatoes, tomatoes, salsa mix (cilantro, peppers, onions, mini garlic, tomatoes), summer squash, cucumbers, celery, lettuce, beets?, and more……. 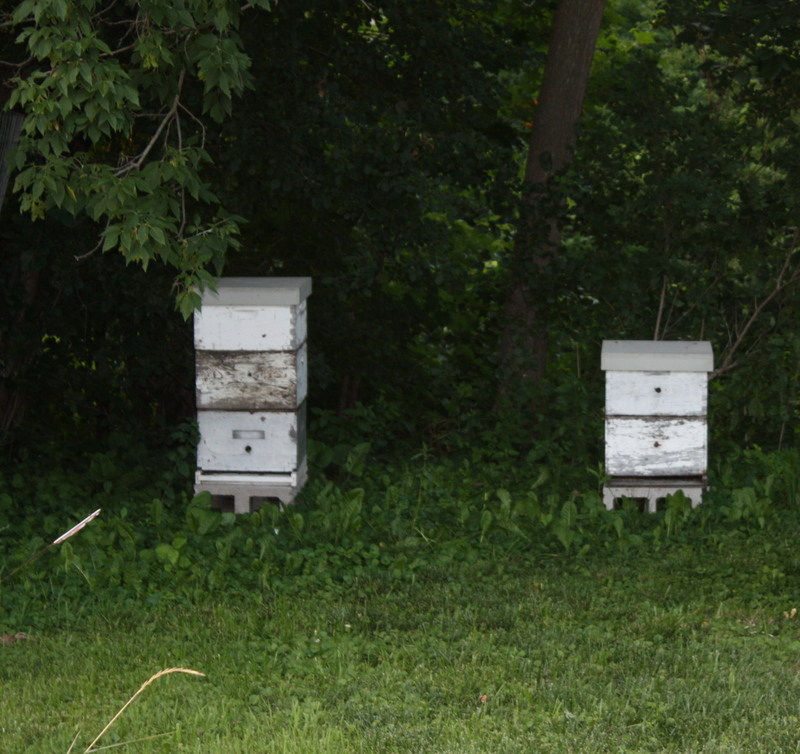 This week we will visit the bees and harvest Spring Honey. I cannot wait to see and taste the harvest. Love all your comments this week……all things are good. Wow the leafy green lettuce is something else. 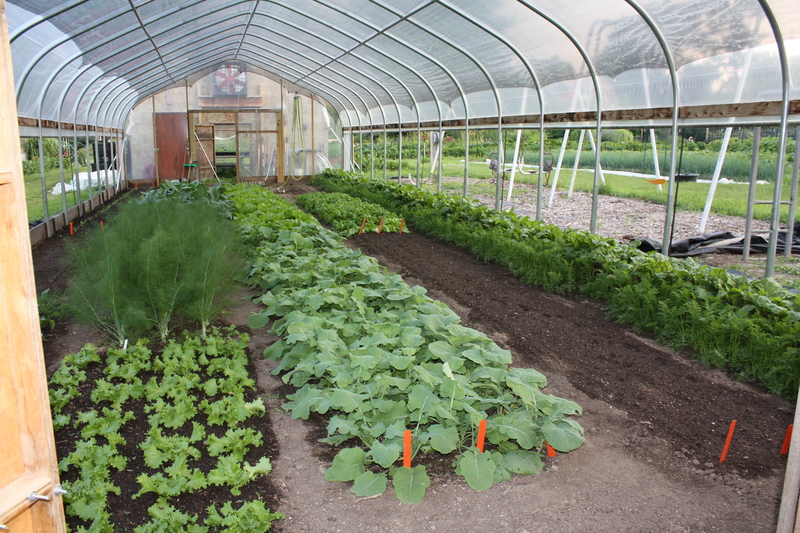 The hoop house seems to have made a difference. Summer half over…how’s Maeve’s playground comping.